It's that time of year: back to school. It seems like every year, Back to School promotions start earlier and earlier. But the great thing about September and the new school year is back to school shopping! As quoted in Vogue's September Issue documentary, September is the New Years of fashion. It's when everything is reset and everyone decides who they're going to be and how they're going to look for the new school year! So as we get closer to the autumn weather, here are my fall fashion essentials to make transitioning into the cooler temperatures easy! Let's start with outerwear! I love being able to layer so that's one of the reasons I love fall. I'm especially excited for this fall because this summer I purchased this beautiful leather biker jacket from AllSaints! Stay tuned because you'll be seeing a lot of lookbooks with this! 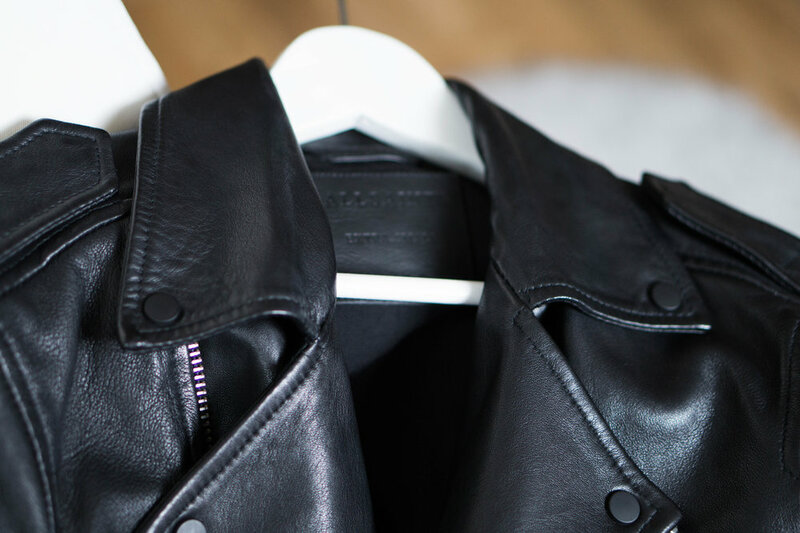 A leather jacket is one of those timeless pieces everyone should invest in. It's one of those pieces that will really stand the test of time and as you wear it, it will start to shape and conform to your body, creating a really tailored look no matter what size you are! Another outerwear piece for the fall is a denim jacket. Denim jackets are another great layering piece that can create an effortlessly chic look. Unlike the hefty investment of a leather jacket, denim jackets can be purchased at fast-fashion retailers like H&M and Zara. The one above is from Zara and I have had it for almost 4 years. Over the summer, dusty rose and neutral pink tones were incredibly popular! For the fall, get ready to see more burgundy and darker, more muted colour variations of reds and pinks. So since we're going to be seeing similar colour schemes for the fall, we might as well keep those lighter colour variations from our summer wardrobe and integrate them into our fall wardrobe. A lot of retailers are now having their summer sale so you can grab those trendy summer pieces and find ways to integrate them into your look for back to school! Photographed above are a dusty rose jersey t-shirt and a pale violet button-down from H&M. Although they're not burgundy, they're very muted and cool toned which match the cooler weather we'll get this fall. Put away your summer shorts and make room for some new pants — more specifically, new denim. DenimKratos has got you covered (literally) for the fall weather with great quality, raw denim. Their denim is super durable and strong and help you keep warm this fall! If you're interested in grabbing a pair, check out my full review of DenimKratos here which also has a discount code for you to get 20% off your entire purchase! And what's fall without fall boots? This fall I'm switching it up with these distressed faux-leather work boots from Zara. Unlike the chelsea boots which you know I love, these offer a more casual, relaxed look which works really well if you want to wear a denim jacket. These boots also come in brown (which I also have)! Are you excited for fall? Leave a comment below and let me know what fall fashion piece you're excited to wear!